(Sound Familiar) You wake up and BLOOP! Your whole friends list is FREAKING OUT because of some new change on Facebook. Tune in this Wednesday to learn how you can make the most out of crazy social media changes AND why they are the best thing that can happen for you and your biz! PLUS – we have a few gifties for you! Oh, my gosh, what the heck is happening? Right? Okay, we've all had those moments where all of a sudden, everything, whether it's Facebook, whether it's Twitter, whether it's instagram, all of a sudden, everything looks completely different. 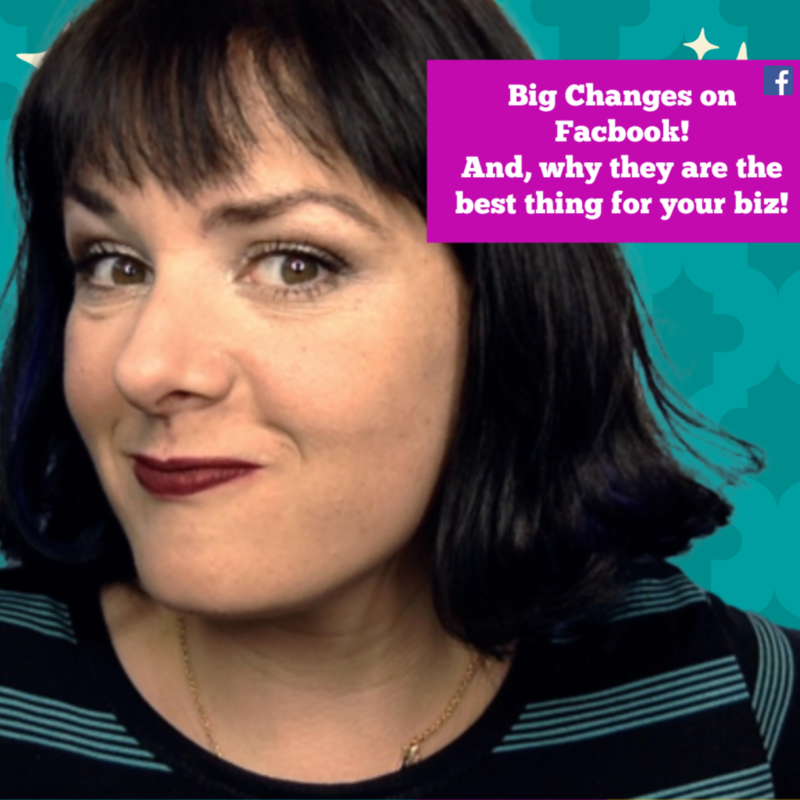 So I want to know, first of all, what is the craziest big change that you've experienced on Facebook, where you had a moment of like, Oh, my gosh, I can't believe this happened. Okay, so tell me that. First of all, that's what I want to know. And we're going to talk about some big changes that have happened recently, and how you can prepare yourself for the next big change. And if you want access to the show notes from today's show, because I'm guaranteed I'm going to talk pretty quickly. My name is Molly Mahoney. If we don't know each other, I talk really fast if you would like access to the show notes. And also this really some other really cool stuff, which I'll explain in just a second comment below with the words these two words together. big change, it's a couple of with the words big change. And we're going to go through a whole system and the strategies that you can use so that you can stay ahead of the big change. We just have a few tips today. And they are powerful. #1 Ist It A Glitch? So the very first one that I'm going to show you is you want to know, is this actually a glitch? Or is it a change? So for me, I always have a few people on speed dial that I know I can call I can message on Facebook and be like, Oh my gosh, dude, I've known longer able to boost my pre scheduled Facebook Lives. What's going on Facebook? What's happening? It's actually a glitch. It's not a real new rule. And you have to ask people figure out if it's only happening to you happening to other people figure out if it's a glitch. Sometimes it's a little tricky, right? This is the most important thing, the number one strategy that I use for everything in my business, whether it is Facebook Live, whether it is life, whether it is business, it is my number one method, the FF TT method. And here's what it is, it is they said, you have to recognize that this problem, this change, this thing has happened. Sometimes it might make it like, Oh, my gosh, I can't believe I'm freaking out. I'm stressing out, you want to recognize that it happened. So you face it, then you feel it, you're let you let yourself get a little bummed you let yourself be like, Oh, I can't believe I have to go change my header photos on every single group that I'm an admin on. I can't believe I have to go change my cover photos on every single Facebook page. I manage. All my clients are freaking out. Whatever it is, we're going to face didn't feel it. But your goal is to make the face it and feel it as quick as possible. So the next step is the T which is twisted. So literally, as soon as you're like, Oh, this is so annoying. You want to ask yourself, How can I make this a positive? How can I make this a positive? How can I make this a positive? How can I make this positive? Sometimes you ask to ask yourself for like a whole week. But the real good thing to do is to be able to only ask yourself that once and then like your your positivity will start moving. And you will start being the person that everyone wants to follow and stay connected with on Facebook. Because you're not being a negative Nelly, you are being a Positive Polly. Okay, so face it, feel it. let yourself feel the frustration and then twist it. How can I make it a positive and then once you've made it a positive like one example that we were talking about over on our be live page earlier today with be live TV. My favorite tool for going live on Facebook is the algorithm change in groups, the notifications and groups it's been happening right now it's cinco it's like super annoying. But if you can be the person who figures out how to hack that algorithm change, dude, you have such an awesome opportunity for staying ahead of the curve, right. So we use a strategy which I'm going to share with you really quickly, we use a strategy where we put super valuable content inside our Facebook group. We even do giveaways that are announced inside our Facebook group. So that people have to opt in to our Facebook group in order to get access to the content. Now, sometimes we require that they give us their email address, or they opt in via messenger bot first, before they actually get access to the Facebook group. which then allows us to build a community that we can follow up with us these changes as opportunities. Okay, so that was twisted. Once you have faced it, you felt it, you've twisted it, then you're going to think it so man staying in an energy of gratitude. A place of gratitude will change everything for you and your business. Whether this is about Facebook, or not stay in that place of gratitude, right. I got something for you, the MollSTARS VIP! www.mollstars.com. And we have a VIP group, a marketing membership group where we keep you updated on all of this stuff so that you don't have to worry about it. I love being a crash test dummy. I love answering all these questions. I love staying ahead of the curve so that you don't have to figure it out. I figured out for you. Someone was asking recently. But yeah, then that means you're the first person not me. totally true. But I'm going to save you so much time. And right now. We have just under 200 people in that membership group. There are 2 billion people on Facebook. So I think you've got a pretty good chance of standing out if you're a part of that membership!